There are cheerleaders and footballers, and they get killed. The end. I took a couple of things away from watching Varsity Blood. Firstly, I feel the need to go back and say, in retrospect, I might have been a bit rough on All Cheerleaders Die, because despite its flaws, I at least had fun watching it. 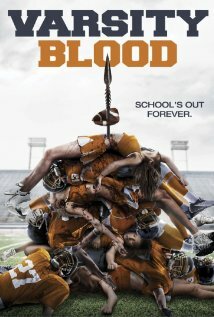 Not that there are any real similarities between the two movies other than their use of cheerleaders and football players; but I just found myself wishing for some of the fun, wit, or intelligence of All Cheerleaders Die while watching Varsity Blood. Secondly, while I might complain about the lack of plot in other movies, I can now say with certainty that I don’t like it when there’s a lot of plot that’s all being spelled out in an inordinate amount of exposition. I almost felt sorry for the actors in Varsity Blood, because they just had so many lines to say. There was just so much word vomit that I was almost mesmerised. It’s too bad that none of it was actually good dialogue (in fact, I found myself laughing out loud at some of the lines – and I don’t think that was the intended response). The plot is bad (even with its “twist”); the characters are unlikable, and make ridiculously stupid decisions; and the kills are barely worth the wait. It actually pains me a bit that this movie currently has a rating of 5.3 on IMdB. Is this really the standard that we expect now? Really?